The knowledge economy requires that social science researchers start questioning the type of knowledge they are producing and the type of methods they are using to produce this knowledge. This chapter explains how the knowledge economy is linked to creativity, innovation, and qualitative research. This chapter aims specifically to highlight the need and importance of innovative research methodologies in a knowledge economy. Emerging innovative qualitative research methodologies in social sciences are briefly identified, and arguments for and against methodological innovation are explored. The stages of creativity and phases of innovation are highlighted in a research environment to show social science researchers that innovative research methodologies can be generated and that barriers to creativity and innovation can be overcome using various techniques. 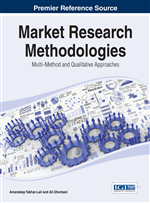 After reading this chapter, the reader will be able to apply creativity and innovation to identify new and novel ways of undertaking qualitative research, as well as being able to integrate innovate methodologies with existing methodologies. Researchers have various preferences when it comes to identifying and using suitable research strategies when they undertake research in social sciences. Often their preferences can be linked to the way they were taught by their research supervisors or the strategy they are most comfortable with, rather that the type of knowledge that the research will produce. The challenge is that people are the objects of social sciences and they are able to ascribe meaning to their environments(Schutz, 1962, cited in Bryman & Bell, 2011). Researchers need to view the social world through the peoples’ eyes to truly understand events and the social world. This understanding will lead to valuable social knowledge being produced, because researchers will get the ‘insider view’, be able to probe beneath surface appearances and gain deeper understanding due to the attempt to give people a voice (Casey, 1995 cited in Bryman & Bell, 2011). Power imbalances are also prevented if people actively participate in knowledge generation and knowledge production about themselves (Bless, Higson-Smith & Sithole, 2013). Participation in knowledge generation can lead to long-term solutions to social problems as well. There is therefore a need that researchers critically look at the use of innovative research methodologies to generate social knowledge and to question the types of knowledge that results from any of their research activities. Qualitative research seems to be more suitable for innovative research methodologies because it aims to understand respondents’ lived experience; examine the way respondents construct meaning in their lives by studying people in their natural context; describe diverse respondents’ experiences and specifically amplify respondents’ voices (Bless et al., 2013).